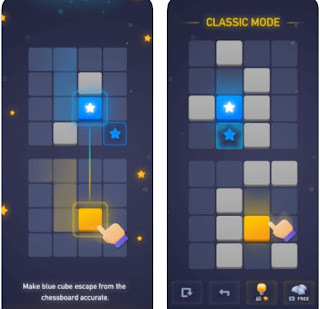 The PAGY Awards were established in 2011 to honor the best Puzzle Apps Games of the Year. Mindom comes from Peng Wan. It's a gem. The object is to move the yellow square in the bottom grid to control the blue square in the grid above and get to its destination. 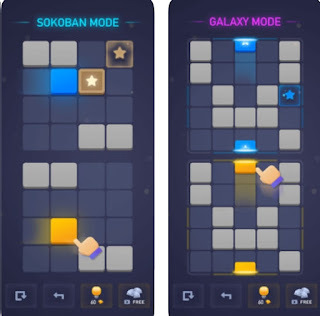 More advanced levels include a sokoban element with wormhole for either the yellow or blue squares. What's particularly interesting is that sometimes the grid below is smaller than the one above. 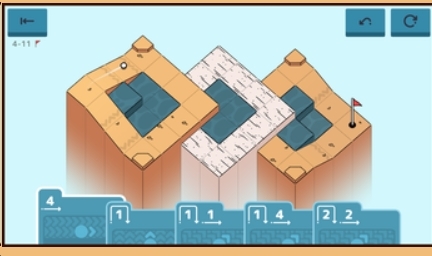 It leads to some very interesting puzzles. There are some 400 levels. At the moment I've done about 120. Loyal Blog Follower Robert point this interesting game out to me: Golf Peaks by Lukasz Spierewka. 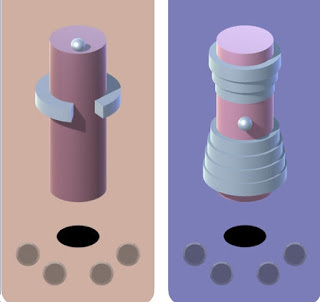 It's a very solid game where the object is pretty obvious. Look at the 2nd image. On the bottom are 5 cards. Your task is to figure out which card to use, and in which order, and in which direction to aim the ball, to reach the goal. A number that's underlined with a 3 means that the ball will travel 3 spaces. If a 1 has a loop around and above it, that means that the ball will jump. Used for sandtraps and the like. 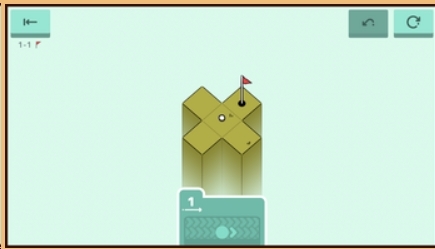 Golf Peaks is essentially a maze game. 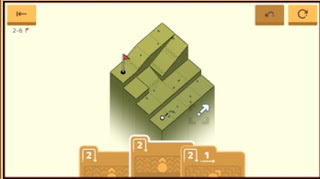 There are 72 levels (4 rounds of golf). I've done 36. There's a lot to like about this game: the graphics are good. The puzzles are challenging. But all the levels can be solved almost blindly with trial and error. I'm not feeling compelled to complete them all. This is a very very solid game. Check out my progress in Flow Free: Warps! Unquestionably, some of these were tough and took a while. I started playing this game a little more than a year ago. Now it's become a habit to solve the daily puzzles first thing in the morning. 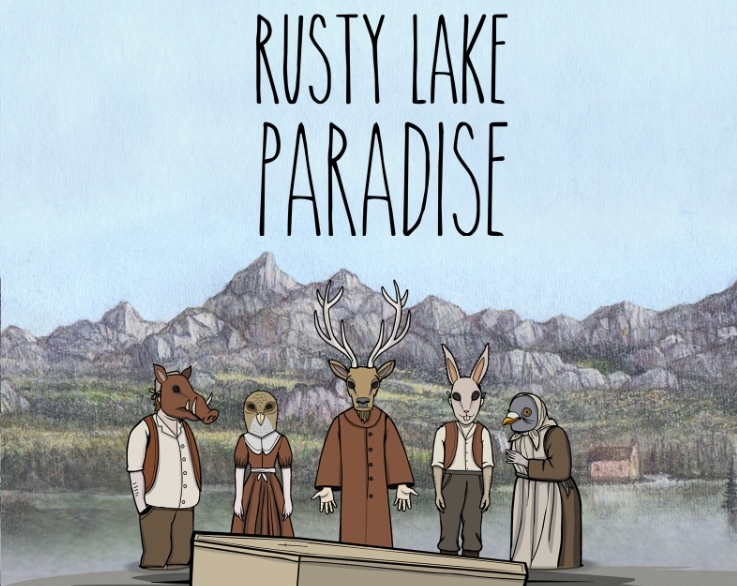 I'm a huge fan of the Rusty Lake series. 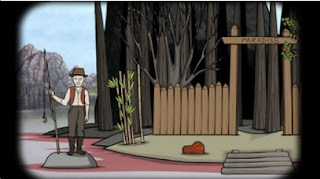 The games can best be classified as a combination of horror/room escapes/adventure/puzzle. Paradise takes place on an island. 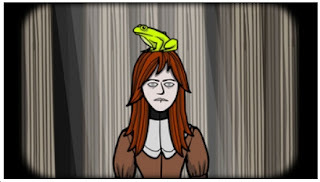 There are 10 plagues to delve into. If you've ever played a Rusty Lake game, then you can expect: strange creatures, a ghost, weird puzzles. Animal heads. At the moment, I'm on the 9th plague. 1. Too much time is spent going back and forth. There should be a map which enables the user to quickly go from place to place. 2. I finished the game having only captured only half of the souls. I have no idea how I missed them! 3. 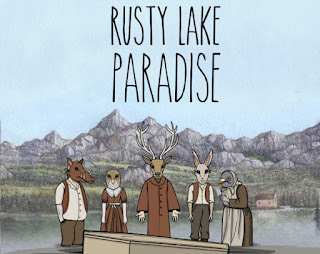 Having played so many of these Rusty Lake games (see list below), I'm starting to feel like they're all the same. what was fresh, strange with horror, and clever with puzzles, has seemingly become stale. David Ferriz recently contacted me about his new puzzle game Kolumno. It's a dexterity game. The object is to get the ball to roll down as the column spins. There will be gaps for the ball to pass through. It's all about timing. 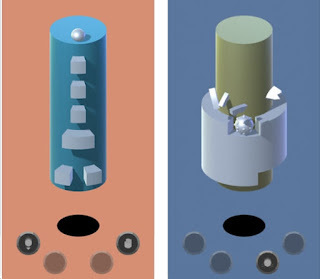 From David: This game will also test the player’s reflexes by using special abilities that will let you: stop in mid-air, fall rapidly, shrink or break the rings. 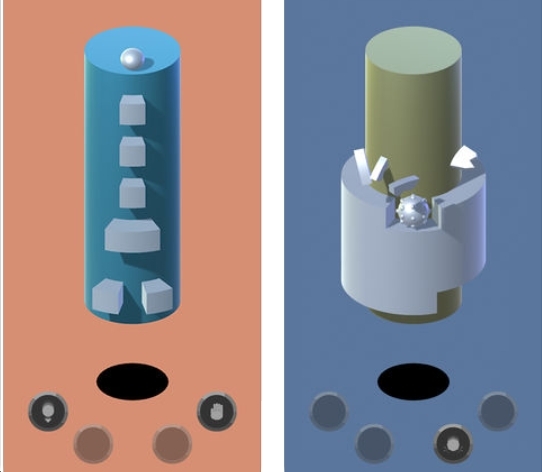 At the beginning, Kolumno was born as a remake of our classic Zyl (a game played by millions of people in its Flash version at the start of this decade), but during the development we decided to include new abilities that have finally turned Kolumno in something absolutely different, preserving the elegant initial concept and providing a much more complex and elaborate challenge. I remember playing Zyl a while ago. Hard! I was impatient. Kolumno is much the same.